Would a Heat Pump be Suitable for You? Please get in touch to enquire. There are several types of heat pump but all share the basic principle of extracting heat from a natural source and concentrating it to obtain a higher temperature. This gathered heat is usually then applied to water for space heating and hot water. The device which does this can be thought of as a refrigerator operating in reverse. It is usually powered by electricity, but the amount of heat energy delivered is several times more than the electrical energy consumed. The ratio of the output to the input energy is called the Coefficient of Performance (COP). 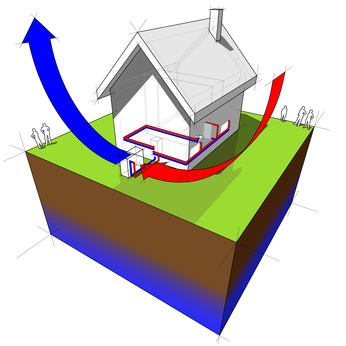 As heat pumps transfer rather than produce heat they are more efficient than traditional heating systems. However they generally operate at a lower temperature than boiler systems so benefit from the use of larger radiators or under floor heating. A good standard of building insulation is also necessary. Domestically the benefits of heat pumps is that they are often thought of as a ‘fit and forget’ technology since they require little maintenance and eliminate the need for fuel deliveries required by other types of domestic heating. Heat pumps can also provide both space and water heating, thus significantly lowering fuel bills. 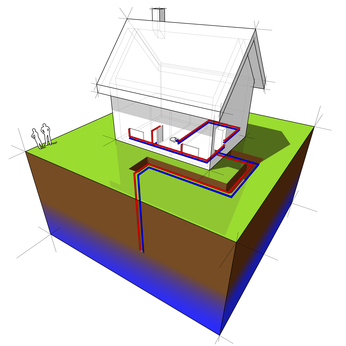 Obtain their heat energy through pipes buried in the ground. The temperature of the soil even just a metre or two down is very stable throughout the year in the UK. With COPs of up to 5.0, open-loop GSHPs offer an environmentally friendly source of heating with significantly lower running costs than a conventional heating system. As underground water temperatures remain constant throughout the year, an open-loop system can maintain high efficiency all year. Open-loop systems remove heat from ground water, usually extracted via a borehole into an aquifer. The water is then passed through the heat pump where an exchanger takes the low grade heat from the larger volume of ground water and exchanges it to a smaller volume inside the system which effectively concentrates the heat. This heat is then delivered to the domestic hot water system and/or the space heating system. The ground water is returned underground where it immediately begins to regain heat from the earth. These systems are considered ‘non-consumptive’ when the same volume of water is returned to the same aquifer from which it was extracted. Occasionally the water is used for other purposes, for example it can be filtered for domestic consumption before being discharged or used for garden irrigation and other ‘grey water’ uses. In such cases it is classified as ‘consumptive’. In these cases open-loop systems should only be installed in areas where there is sufficient groundwater available. Similar to open-loop systems, closed-loop GSHPs obtain their heat energy through pipes buried in the ground. However instead of circulating ground water, these schemes consist of a closed pipe system filled with thermal transfer fluid in the form of an anti-freeze solution. The fluid absorbs heat from the ground which is then passed through the heat exchanger as it travels around the pipe. A key benefit of these systems is that they can be installed virtually anywhere. Obtain their heat from the ambient air, using a fan unit located outside the building. The pump converts heat from the air into more useful energy through a heat exchanger similar to ground source heat pumps. Residential air source heat pumps can save more than 2 tonnes of carbon a year, emitting up to 20% less than gas boilers and up to 70% less than electric systems. As well as being used to heat in winter, some heat pumps can be reversed to cool in the summer, when the unit takes heat out of the indoor air and releases it outside. Water source heat pumps are much rarer. These pumps can be both open-loop or closed-loop as described above, utilising the heat from a pond, lake, river, stream, or other body of water to provide heating for nearby homes. In these types of pumps, the water is drawn in to the pump’s heat exchanger, where the heat is extracted and the water is returned to the source. When used in relatively shallow waters they can be subject to seasonal temperature fluctuations and may suffer a loss of efficiency during cold weather.